iWindsurf Community :: View topic - Hello all. It's been a while. Hello all. It's been a while. 1. No, foot straps are not used by 100% of windsurfers with intermediate skills (unless foot strap use is arbitrarily defined as a requirement for "intermediate status). I'm proof the 100% level is not met. Water starting is also not a requirement for intermediate skills, I'm also proof of that. 2. I do agree both foot strap useage and water starting are skills that help windsurfers achieve more planing. 4. If you want to go the shortboard route I think others have given good suggestions. But, I think the way to increase your windsurfing enjoyment is to increase the variety of Louisiana winds you can enjoy. That means you should consider a longboard for your next board. A used or new Kona One for example fits your lake conditions very well, as would any old style longboard, planing with the daggerboard retracted when you have planing conditions, going upwind as well as possible with the daggerboard down in non-planing winds. The best part about longboards is the ability to go windsurfing and have fun in almost all conditions. Some windsurfing fanatics must have planing winds and suffer for days when strong winds just aren't there. Some windsurfing fanatics like me go windsurfing whenever the time is available and have equipment like longboards so 5 mph to 25 mph is enjoyable. I wouldn't put straps on the big board you have. I have an ahd sealion and it has no straps. But the Sea Lion is made for carving, which is GREATLY enhanced by moving our feet/weight all over the deck. Getting it way up on one rail -- and especially back on the other rail a couple of seconds later when chasing small swell or big chop -- requires quick footwork. I don't think that board in the picture is designed for that. Thanks for all the great responses! 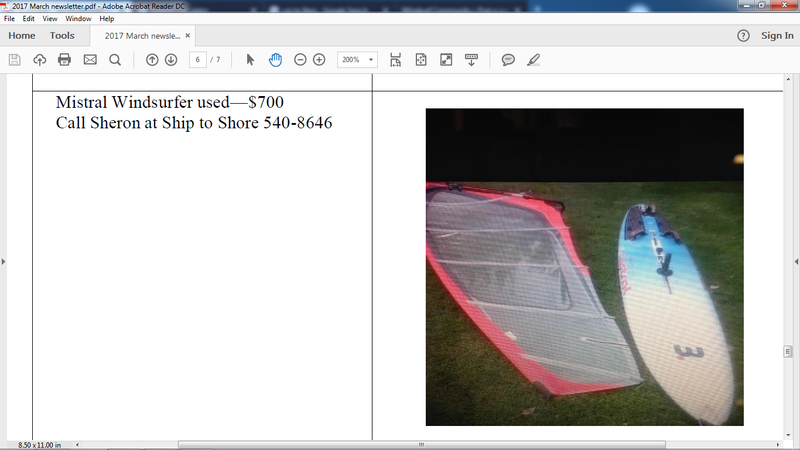 I will look at a used board that has been for sale at a local marine shop now for years, Thursday. (The owner is a member of the Yacht club I used to be a part of) So I've seen the ad she's been running in the quarterly news letter forever now. The pics look kinda small though. if it's in good shape. It's a mid 1990s board. I agree with $200 as the general open market value. But, I would be willing to pay $300 to $400 total if it would cost $100 to $200 more just to ship a better longboard to where you are. A better longboard would be about a foot longer, such as a Mistral Equipe. Maybe the owner can be brought up to date on current prices for 22 year old boards. Last fall a pretty new Kona one (about 2012-2014) with a complete rig sold in the Kansas City area for $500. I didn't buy it only because I already have two Kona's and it was 325 miles away. If you do consider the Mistral Escape, be sure to closely examine the universal, mast track and centerboard for their connection integrity and working order. Missing components or problems in these areas can be problematic and tough to replace.